6 Reasons working on your vacation ( might ) benefit you! Sometimes when we run our business it can feel like we never get a break. You might find yourself glued to your laptop, poring over books and notes, when you should be snorkelling and snoozing. For many of us, that’s just the way we do it. It’s a permanent fact of how we run our operation. For others, it’s simply a bad habit we can’t escape. On the other hand, some of us entrepreneurs want to be working during our holidays – making calls, networking, brainstorming and more, yet can’t seem to get into the habit. Even if we want to. Finally, there’s a group of us who are just on the fence, unsure as to whether or not it is a good idea, because, to be honest, we don’t know the long term consequences. Will working on vacation burn you into toast? Or will it make you a more efficient, effective businessperson? 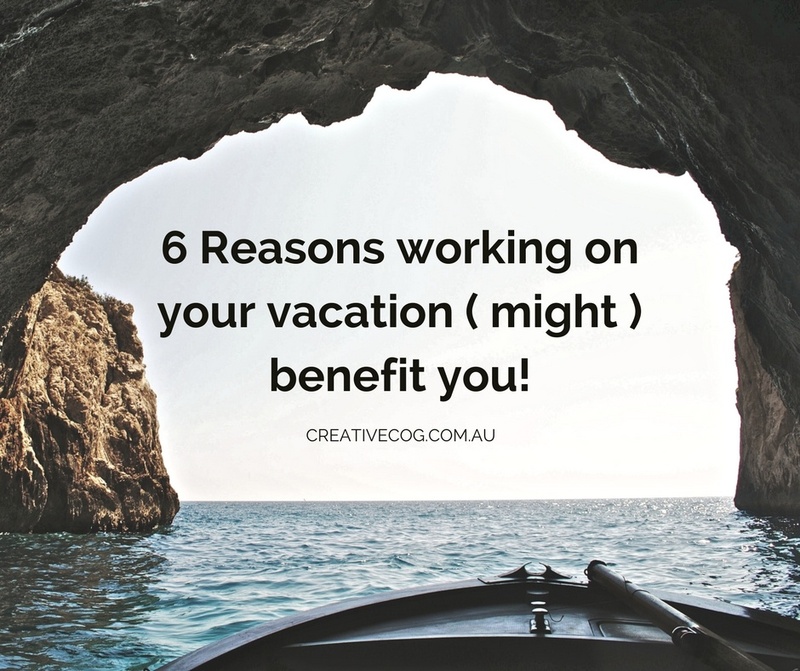 If you’re unsure, have a look at these 6 things I learned working on my vacation, and how they might actually benefit you. Disclaimer: This is for people running their own businesses and trades, not employees! I wouldn’t work on my holiday as an employee myself, but each to their own circumstances. As a writer, many things bring me into writers block. But I truly believe there is one main, primary cause: simply, writer’s block occurs either because we’re too stuck stuck in a routine, or a complete lack of routine. As an example, during my holiday I wanted to do two things: relax in the sun, and brainstorm ideas for my clients. But nothing was coming through. I had everything I needed – coffee, notepad, wifi – I even bought down my research textbooks. No ideas. Complete writer’s block. But then I ran a scented bath. Great way to spend the holiday, right? Relaxing in a fragrant bath with a cup of tea and a book. But the moment I began to relax, thousands of ideas for my business seemed to emerge out of nowhere. Next thing I was writing notes and poring over books while still soaking in the tub. I really do believe that the way to shake out our creative or inspirational blockages, is to change our scenery. Not just our scenery, but our whole lifestyle (even if just for a while). And what better time than during the holiday? There’s no point in saying, ‘I don’t have an idea today… so I should just [do something unproductive]’ You should stay alert for the moment when a number of things are just ready to collide with one another… The reason to keep working is almost to build a certain mental tone, like people talk about body tone. You have to move quickly when the time comes, and the time might come very infrequently – once or twice a year, or even less. I think Brian Eno is saying something which most of us know – that to get good at something, you have to do it consistently, and to stay good at it, you have to… that’s right, do it consistently! What I found is that my vacation was the perfect time and place to devote at least some time daily to maintaining the skills I was developing as a small businessman. I keep myself in awe when I remind myself, that my next big idea might be just around the corner. You can learn to relax without vacations, in fact it’s better to relax without them. Now, I’m not saying you should not take vacations. Of course not. That would kinda defeat the whole purpose of this article (Ha!). What I’m saying is that, by working on my vacation, I found it easier to appreciate the luxury time I have between vacations. When the weekend arrives, I’m more excited about getting my mind out of weekday mode. Often we have vacations that… aren’t quite as satisfying as we expected – they don’t ‘recharge our batteries’ the way we hoped. So we come back to work in ‘vacation withdrawal’, as we call it. The problem is that we built up this expectation that the holiday would change everything, that the end result is we feel disappointed and let down. I think it’s good to know strictly when leisure begins versus when business begins. But do I need to allocate four weeks per year for that? I just can’t bear the thought of running myself thin until the end of the year. We do the same thing with our week – we might stay up late during the weekday, lose valuable sleeping time and promise to ourselves to ‘make up for it on the weekend’ by sleeping in, as if sleep is a debt that we need to pay off. Here’s a funny article by Cracked.com that explores this myth in more detail. So no, Instead, I’m in better control of my business / leisure cycle, and I thank my routine. Finishing work at 7pm every day and leaving the rest of the time to myself is much more powerful than draining my batteries throughout the year and relaxing for a few weeks afterwards. You appreciate the holiday more. We all know that ‘the grass is greener on the other side’, right? That’s part of the reason we take breaks. I mean, taking your eyes off the computer screen and having lunch is important, but really, if we worked eight hours without a break, it’d be a bit easier to lose appreciation for our job. So I thought to myself, doesn’t it kinda make sense that we… take breaks from our vacations, too? It sounds like an oxymoron, but if we can use that logic, then what really is a break? Just.. doing the opposite of what you’re already doing? I take a break from eating by fasting? I take a break from the computer by going outside? I take a break from vacations by… doing some work? Have I opened a pandora’s box here? So what I realised is that by taking a ‘break’ from my vacation (by doing work) actually helped me appreciate how awesome it is to spend the rest of the day doing not much at all! It’s like working but at my own pace. Why not? Now, by ‘appreciate’ I don’t mean you will ‘enjoy’ it more. Some work is just meant to be hard. I don’t think you should be expected to enjoy all your work. But I think it helps us ‘appreciate’, in the traditional sense of the word, which is basically, you recognise the value and worth of your work. If I’m able to fit into my relaxing day some project or brainstorming session, something which might have taken a long time during the daily grind, I appreciate just how easy it is to work when I’m not holiday. Think of it, if I can do it when in holiday mode, surely I can do it better when I’m in work mode, right? If not, then I have to ask myself what is it about my daily work environment that makes it so much harder. Is it the environment? Distractions? Workmates? Is my desk not ergonomically suitable? In the end, I have a better sense of how I can make my workplace work for me. If I can flourish at my job while sunbathing on the beach, cola in hand, then I can learn to appreciate exactly what I am doing wrong and right in my working week. I hope it doesn’t sound melodramatic when I say working on vacation involves a bit of self-discovery. I used to have this routine of working on the weekdays and lazing about on the weekends. I was adopting an employee mentality for myself, which doesn’t seem to work because I’m self employed. Creativity is spontaneous and just can’t be controlled like that. So what happened is during, the weekdays is, I took the mentality too far, as if I were being paid by the hour. As if I didn’t have to work hard or fast, just sit at the desk and act busy until dinner time. As you can imagine, I was getting less done. But when I decided that my business was no longer just a 9-5 job, but rather a part of my lifestyle, I stopped creating this distinction that I was just waiting for my lunch break, and allowed my ideas to flow more freely. This doesn’t mean to say I drain myself during the weekends and holidays. I still do that, I’ve just learned that if I can work leisurely during the weekend and holiday, I have no excuse for not working hard during the weekday, because, as we often say in business, we need results. And you can have all the plans and procedures, routines and schedules in place, but at the end of the day you’ve got to tell yourself that you’re expecting results to happen. Nothing will drive you better to take action, wherever you are – in the office on a wednesday, or on the beach with a pina colada. Well, there you have it! I really hope these points were of interest or value to you. If you have any ideas or experiences of your own working on your vacation, we’d love to hear from you. Leave us a reply below with your thoughts and opinions. Or advice! You might be doing it better than us!